Was perfect for our requirements - a group of seven. Te villa has four large bedrooms, each with an ensuite bathroom. The kitchen is well stocked and the whole house very cool.There is a large garden for bbq's or boule. Honfleur is only minutes away on foot, although there is an admittedly rather steep hill awaiting you as you return. Nicole was a charming hostess, the sun shone every day and we had a splendid week. Very happy that you spent good holidays in our house in Normandy. Thank you very much for your message and your sympathy. Well located for day trips in the area. Healthy hike, downhill, into Honfleur. Our hostess was very hospitable, meeting us upon our arrival and bidding us farewell at the end of our stay. She attended promptly to a problem that we had with the clothes dryer. Having ensuite bathrooms was a real bonus since we were four couples. Bathrooms were well supplied with towels and some toiletries. We felt very comfortable at this property and would recommend it to others. Nous sommes ravis que vous ayez passé un bon séjour dans notre propriété. Excellente communication, respect des lieux, tout est parfait, MERCI . Nicole met us an walked us through the house and how to operate the kitchen/laundry etc. Everything went smoothly. Gracious bedrooms and baths. Delightful home and easy trip to Honfleur with many restaurants and shops even in late Dec.
We're very pleased to receive you and your friends. We had a wonderful time. The house was great, and the view from Mont Jolie is fantastic. Mme. Saeys was very helpful and friendly. Highly recommend. Perfect for large family holiday. Great garden for energetic dogs. A lovely house for our annual Family get together. 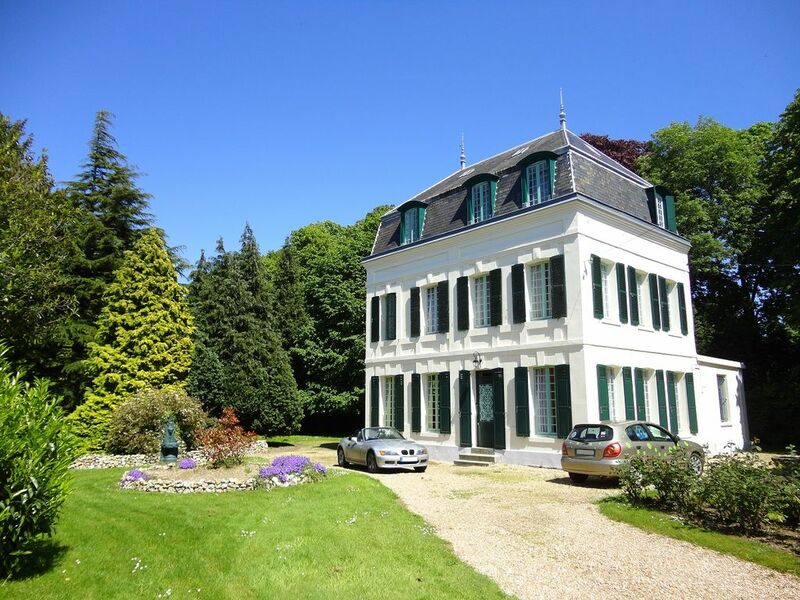 We are a family of eight, and we spent a lovely week in this splendid house between Mont Joli and Cote de Grace, both affording beautiful views over Honfleur and the Seine estuary. The house is beautifully decorated, with everything you will ever need. 4 delightfully decorated en suite bedrooms, with loads of towels and lots of extras that you really appreciate, and very rarely get. Very very comfortable. We spent most evenings enjoying each others company, food, wine and playing games round the large dining table. The house stands proud, in its own very large wooded enclosed garden, which the other member of our party: Ash: our English setter thoroughly enjoyed. The surrounds are a patchwork of Norman style houses old and new. The house is in walking distance of Honfleur. 10 minutes down, 20 back, but, if you take your time, stopping now, and again to enjoy the view, it is well worth it. Bayeux, Caen, Deauville, Trouville, Lisieux, are all within easy distance. As is Criqueboeuf with its dog friendly beach. The D day beaches are a little further afield, but, for a days outing it is easy. Jean and Nicole were excellent hosts and helped us out with a problem, with no worries. We just knew they were there if we needed them. Lovely weather, good company, and an outstanding house, all manifested into a wonderful week. We all agreed it was the best property we had visited for our family week. Thank you so much Sheila , John and your Family for your conviviality, your sympathy and your lovely Ash. We're very very pleased to receive you in our property. If you come again in Normandy, it would be with a great pleasure that we would welcome you. Les clés sont remises par le propriétaire à votre arrivée. Ces dernières devront être remises en mains propres à celui-ci, lors de votre départ.